Brown Trout on fly are an exciting freshwater fish species to catch, and they are just as beautiful as the Rainbow Trout, especially the wild spawned juveniles that are found in the various mountain streams of the Drakensberg and Western Cape – this is where they are most at home. 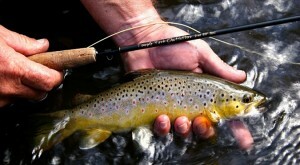 The Brown Trout are very well known by their scientific name of Salmo trutta. 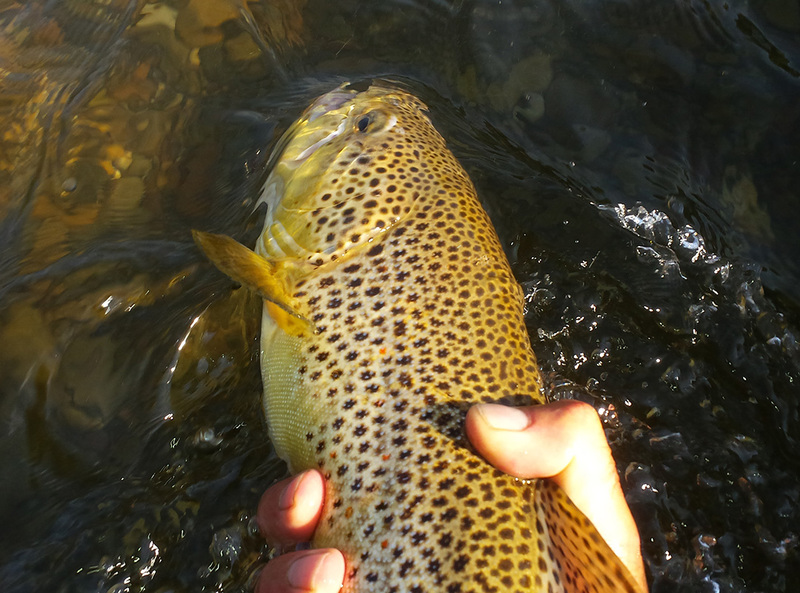 The Brown Trout is a beautiful fish species, with it’s golden brown/yellowish colouration. They also have brown, black and red spots on them, which make them a very attractive fish to look at. A signature of large male Brown Trout is their extended jaw, which is known as the Kype. The Brown Trout is found in Mpumalanga, the Western Cape, Eastern Cape, the Free State and KwaZulu Natal. They prefer the rivers and streams in South Africa, where they have been thriving since the 1890’s… They were one of the first of many fish species to be introduced into South African waters. 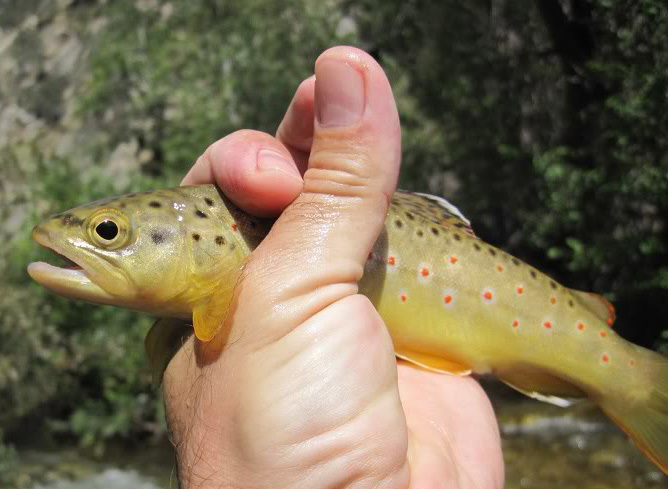 Learn more about the history of Trout here. 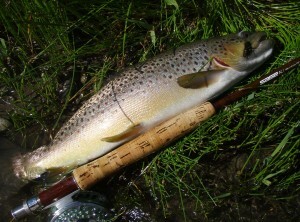 The Brown Trout was the first of the Trout species to be introduced into South Africa. It prefers cooler waters and areas with lower temperatures. It is less tolerant of warm temperatures than the Rainbow Trout. The Brown Trout is less common than the Rainbow Trout in South Africa, because it has specific temperature requirements. They need clear, well oxygenated water that is less than 21 degrees celsius. They require water temperatures of 16 degrees or less to spawn and breed. Spawning and breeding generally takes place from early May to late August, where the fish move upstream to areas with gravel bottoms. The males move in first and almost fight each other (If we can call it that) for territories. The females lay their eggs in areas of the gravel and they are then fertilised. Depending on water temperature, the eggs usually hatch within a month. The young Trout are moved further downstream with the current where they start feeding. Brown trout feed on a variety of organisms, from plankton, insects, insect larvae, mayflies, caddis, midges to crabs, platannas, frogs and fish. They can grow up to about 6 kilograms sometimes larger, and can reach lengths of over 75 centimeters. They can live longer than Rainbow Trout, normally 6 – 7 years. Slow Day Trout Fishing, Not Anymore! Fly fishing for the Brown Trout dates back hundreds, and possibly thousands of years, and over this time there have been a variety of techniques used to catch both the Rainbow Trout & Brown trout, the methods we find most successful can be seen below. There are 3 main methods for catching Brown Trout in streams and stillwaters around South Africa. 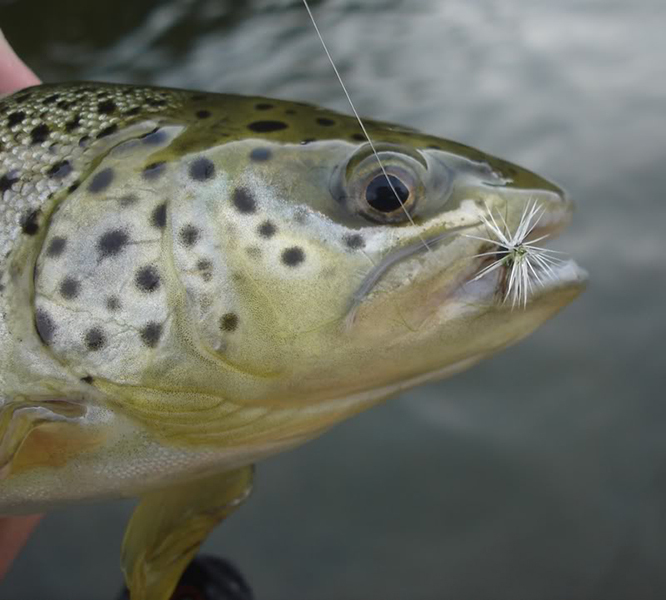 Brown Trout rise during hatches of insects, such as mayflies and caddises, and can be caught throughout the day on a dry fly pattern. This is easier said than done. A 4 or 5 weight fly setup can be used on stillwaters and 2 to 3 weight on streams. Floating line is essential as you are fishing floating flies. You also need to do a bit of “on the water research”. See what insects are around under rocks and on the water. Hatches happen sporadically throughout the day, so you need to match the hatch as we call it. Find a fly that resembles the closest thing to the hatching insects and you will be in for a lot of fun. If your dry fly gets submerged, or is wet after catching the fish use a cloth or your shirt to dry it out a bit. There are also various forms of powdered products and oils that can assist with helping your dry fly float perfectly in the surface film. Wet fly fishing for Brown Trout is either about imitating underwater insects, fish, frogs and other swimming organisms, or about annoying the fish until it takes your fly. A 5 to 6 weight setup should be used with sinking or intermediate line on stillwaters, and a 4 weight with floating line on streams is perfect. You generally want a rod that can cast a bit better and one that has more backbone, as the Brown Trout hits wet flies with great force. You can fish a quick retrieve along the bottom, a slow constant retrieve or a short jerky retrieve. These techniques should get you a fish. If not try the “follow my leader” method where you tie a small nymph or bloodworm pattern about 10 centimeters from your wet fly. Tie this to the bottom of the hook. A lot of the time the Brown Trout will chase a big fly out of curiosity and aggression but won’t commit (Have seen plenty of trophy Brown trout follow the wet fly or streamer to the bank only to turn away), so this is a great way to get their attention and then to get them to feed on something more natural and smaller. Nymphing for Brown Trout is a fun and intricate way to target these fish. The best way to this would be to use a 5 weight fly setup on stillwaters, and a 2 to 3 weight setup on streams and rivers. Floating line is needed. Use the current in streams and the wind on dams to your advantage. That nymph needs movement. You can let it drift or you can retrieve it slowly using a figure of eight retrieve. You can use one nymph under a strike indicator, or you can watch the end of your floating line (Which is more effective, but a lot harder). You can also fish a larger heavier nymph with a bead, and a smaller weightless nymph tied to the bottom of the heavier nymphs hook. You are imitating underwater insects and emergers, so there does need to be a bit movement on the flies.